Online retailer Overstock recently hitched its wagon to bitcoin and other cryptocurrencies. And now the company is hoping to cash in on another volatile market: real estate. Overstock announced Monday that it is relaunching Houserie, a real estate property management site it bought in February. The site will be geared toward landlords with services like background checks for potential tenants and rent payment management. Overstock said Houserie will become part of a broader O Real Estate platform that will launch in September and include more information for renting, buying, and managing properties. "Overstock has connected customers with premium home goods, helping them build their dream homes; now, we look forward to expanding those services in the real estate industry," said Seth Moore, Overstock's senior vice president of strategy, in a statement. It's unclear if investors will applaud the move. It's not as if Home Depot (HD), Lowe's (LOW) or Amazon (AMZN) is trying to manage properties. The real estate business is much different than selling home furnishings. But Moore said in an email to CNNMoney that Overstock was not taking on real estate risk with the move. "To be clear, we are not owning these homes," he said. Moore said the site will help people who are searching for a new house or are in the process of relocating, while also selling them furniture to match their new home "more seamlessly." This isn't the first time Overstock has made a move into the real estate business. It set up a real estate search site in 2008, only to close it down in 2011. But the renewed push into real estate is yet another example of how Overstock is trying to diversify beyond retail, particularly through bitcoin. Overstock CEO Patrick Byrne is a cryptocurrency bull. 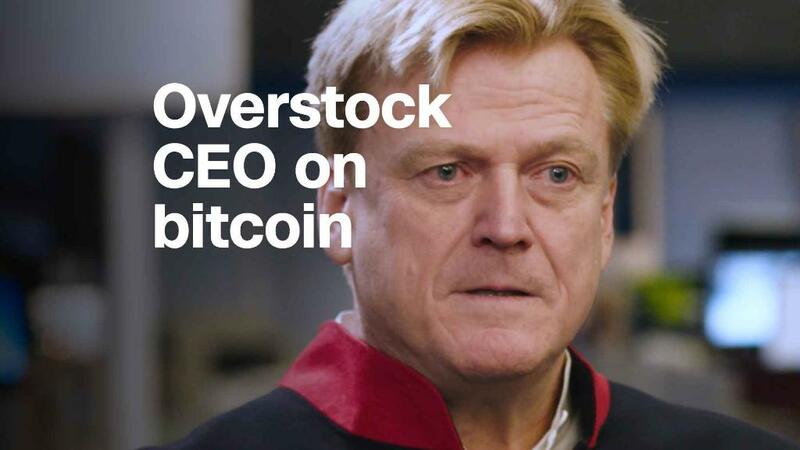 Overstock was one of the first retailers to accept bitcoin. The company owns a venture capital unit called Medici Ventures that has invested in firms specializing in blockchain technology and also owns a crypto trading platform called tZero. Shares of Overstock (OSTK) have been riding the bitcoin wave for the past year. The stock is up more than 135% over the past 12 months but it has plunged nearly 40% so far in 2018. Overstock's bitcoin moves have also made the stock even more vulnerable to attacks from short sellers, investors who profit when a stock goes down. Short sellers borrow a stock and sell it, with the hopes of buying it back later at a lower price and pocketing the difference. Overstock has often been a favorite stock for shorts to target. Byrne was even featured in a "60 Minutes" segment in 2006 about short sellers. And back in 2003, after Overstock reported strong holiday sales, Byrne told CNNMoney in an interview that "when opportunities come along where we can knee the shorts in the groin, that's always good for fun and amusement. That's just icing on the cake."